Our classrooms are full of remarkable stories, but this one is very special. Our high school applied engineering teacher, Mr. Andrew Kuskil, was approached by a parent of one our students. He was asked if the department would work with her younger son Peter to develop a prosthetic hand for him to help with a physical impairment. Mr. Kuskil immediately thought of three students--Taylor Ransford, Cameron Taylor and Robert Donahue--who would be up to this advanced challenge. The students immediately began researching the device. 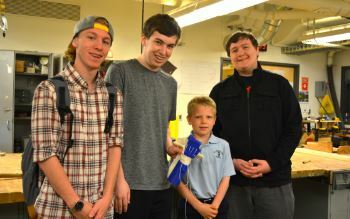 They were soon able to design the prosthetic hand and used a 3D printer to manufacture it. The students are in the final phase of refining and fitting the prosthetic hand so it will be ready for Peter to use very soon. The high school students have demonstrated exceptional expertise in technology, but even more importantly, they have taken great care working with Peter, showing empathy, understanding and making him feel at ease through this process. Peter, on the other hand, is very excited about the whole project, especially since he was able to pick the color of his new prosthetic hand--- a bright Lebo/St. Bernard's blue! This project is one example of the many innovative projects that will be presented at the capstone Honors- Applied Engineering- 3 rd annual, "Guppy Tank Showcase" which is the Lebo Applied Engineering's spin-off of the TV show Shark Tank.